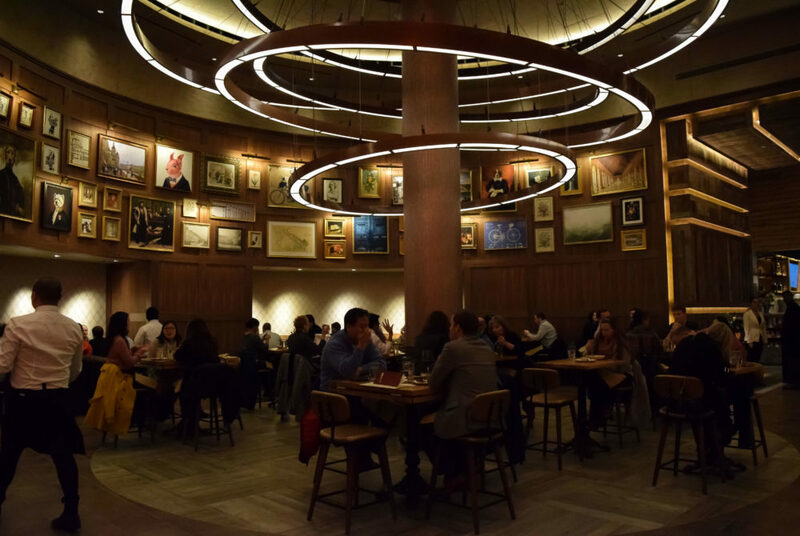 The first part of a new food hall concept by chef Mike Isabella, dubbed Isabella Eatery, opened its doors in Tysons Corner Monday. Although there isn’t a dining hall on the Foggy Bottom Campus, students can now find a replacement if they make the trek to an upscale food court in Tysons Corner. The first part of a new food hall concept by chef Mike Isabella, dubbed Isabella Eatery, opened its doors Monday. The space will consist of nine restaurants, all Isabella’s, spanning 41,000 square feet on the third floor of Tysons Corner luxury retail space Tysons Galleria – which is a 30-minute Metro ride from campus. The new hall, which can be accessed through the mall or from its own entrance on the outside, includes some of Isabella’s most famous restaurants – like Graffiato – as well as new additions like Retro Creamy. High-end touches in the decor – like chandeliers and rich dark wood – separate the eatery from from other food halls. Guests will be able to hop from place to place, grabbing their food to go, but they also have the option to sit down for table service and can order from six restaurants. The restaurants are all in the same location, yet each manages to have its own individual atmosphere. Three of the sections opened Monday: Nonfiction Coffee, Graffiato and Retro Creamery, with the next six locales set to open over the next few months. When walking into the eatery from outside, Nonfiction Coffee is the first sign you see. The shop is designed to be casual, with walls covered by bright green plants and metal accents, giving the shop a luxe feel that is foreign to most messy mall coffee shops. Despite the high-end atmosphere, the prices are affordable. A classic Americano ($3.40) is on the menu, with other expected coffee drinks like cold brew iced coffee and cappuccinos, but they also offer juices from JRINK ($12), and alcoholic beverages. The libations section of the menu features brunch cocktails like mimosas ($7) and bloody marys ($9) as well as cocktails that put their brewed coffee to good use like Irish coffee ($9) made with Irish whiskey, coffee, cream and nutmeg. Coffee shop snacks like croissants, scones and quiches, which ranged from $2 to $7, were also available. The shop also churns out focaccia sandwiches and savory toasts piled high with spreads and toppings for those looking to grab more filling food. Graffiato is the first of the traditional restaurants to open in the space. This restaurant has already become a staple for Isabella in D.C., but this location brings some changes to the menu. Guests have two options when dining at Graffiato in Isabella Eatery. The grab and go bar features a smaller menu of salads, paninis, pizzas and desserts, and allows guests to pick up their food and eat at any of the tables in the available lounges. The main dining area is the restaurant-style section, where guests can make reservations and have their food brought by a waiter. This area also features the entire menu, which includes pasta, cheese boards, different types of bruschettas and more. The gnocchi a la vodka ($18) was smaller than I expected, but it was extremely rich and creamy and still filling. Other guests seated around me ordered multiple plates and shared them all. Graffiato is the spot where all three currently open concepts connect. From the table you can order some Nonfiction Coffee with free refills and ice cream or sorbet from next door Retro Creamery, which unfortunately does not come with free refills. Guests looking to cure shopping fatigue with a sugar high will find Retro Creamery is the perfect place to do so. This 1950s-style ice cream shop features ice cream cones, shakes and sundaes, as well as more old-school options like egg creams, a carbonated sweet soda drink. The shop scoops more than 10 unique, rotating ice cream flavors like mint straciatella and maple bacon, and sorbet flavors like blood orange spritz and gin and tonic. At $4.50 for one scoop and $8 for two scoops, the ice cream is more on the expensive side, but the quality makes up for it. The ice cream is also used as a base for various imaginative sundaes like the Miss Piggy ($11), which includes savory components like pork belly ice cream, peanuts and pork rind in clusters similar to cracker jacks, with sorghum syrup and whipped cream. The shop also offers Italian pastries like zeppolis (three for $6) and cannolis ($5) that follow Isabella’s Italian specialties.